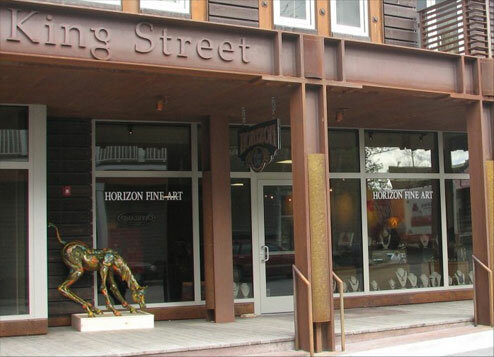 Horizon Fine Art Gallery is a long time original in the quiet resort town of Jackson Hole, Wyoming, being one of few that is unafraid to limit its offerings to the typical Western Art. Horizon encourages both first time buyers and experienced collectors to peruse a gallery that has both international and regional art. We feature painting, photography, sculpture, jewelry, woodworking and fine furnishings as examples of our diversity of art expression. We pride ourselves in showcasing well known artists as well as upcoming names in the art world. Guests with a discerning eye are bound to appreciate Jackson Hole’s most eclectic art gallery. Located a half of a block off of the Town Square in Jackson Hole, Wyoming, Horizon invites you to come and experience a new and different approach to showcasing fine art. Enhancing the Traditional, Introducing the Innovative. Visit our Contact page for a map to Horizon Fine Art.